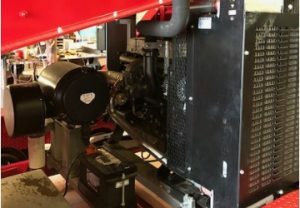 Murphy Products built its reputation on designing and manufacturing mobile soil pulverizers at its Oklahoma City facility. Its Terra Xtreme line gives customers multiple options in terms of size and power and can be customized to best suit their needs. The man behind Terra Extreme is Roy Caldwell who has been designing and building pulverizers for 38 years. His latest project as Murphy Products’ Production and Design Manager is also his largest. 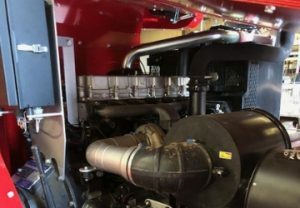 Caldwell’s choice for the power source was easy – a complete Perkins 1106D engine package. Caldwell began drawing up this newest Terra Xtreme Environmental in 2016 as an experimental prototype. He worked on it when he wasn’t busy with manufacturing the other models in the product line. The result is a machine that is 31 percent bigger in the grinder area than other models. He’s improved the placement of the discs and hammers so the soil and clay does not stick to the hammers. The shields on the outside of the machine keep the material contained in the grinder. 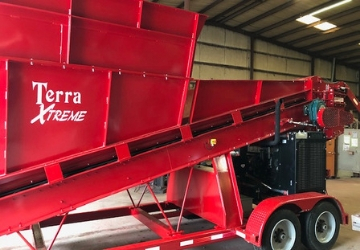 An increased grinder size required a larger engine than what he typically fits into the Terra Xtreme line. The Perkins six-cylinder, turbocharged aftercooled 1106D fit the bill. It’s Tier 3 compliant and provides increased power and torque at the same time noise is reduced. Most importantly to Caldwell, the engine gives him 225hp compared to the 124hp and 129hp in other models. It didn’t hurt that Rick Staton, a salesman in our Oklahoma City office, was helping Caldwell source the engine. The prototype is giving Murphy Products not only a quality topsoil, but increased quantity that is being sold at its Lawns By Murphy business. Still, he’s tinkering with the machine. He’s continuing to experiment with different size hammers and rods and the placement of the knives and hammers. He’ll also increase the size of the hopper. Ultimately this model of the Terra Xtreme will move into production for customers and Caldwell will plan for a Tier 4 engine. “I could sell this one in a second,” he said.